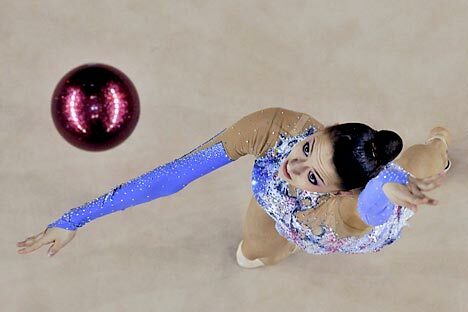 Despite being one of the very best rhythmic gymnasts of all time, Yevgeniya Kanaeva remains dedicated to training. In her childhood, Yevgeniya Kanaeva was a great fan of Princess Diana and collected all manner of posters and stickers with various images of the UK’s "Queen of hearts." Today Kanaeva finds herself in the position of being a role model for many young Russian girls. Clusters of small girls hang from the grandstands chanting "Yevgeniya! Yevgeniya!" as if in a trance while offering photographs and notebooks to be autographed. On Oct. 16, 2011, Yevgeniya Kanaeva was given full marks in the final of the Rhythmic Gymnastics Grand Prix in the Czech city of Brno - when the judges awarded her 30 out of 30 in the ribbon exercise. The 17-time world rhythmic gymnastics champion is currently representing Russia in the Olympic Games in London with a completely new program. According to Kanaeva, “an athlete will never achieve success if he or she stops developing. You have to overcome the fatigue and look ahead, this is the only way you can become a professional at the highest level." Next year Kanaeva will be celebrating 10 years as an elite rhythmic gymnast and her path to success has been as colorful and impetuous as her performances. Kanaeva comes from an athletic family: her father is Greco-Roman wrestling referee and her mother was top flight rhythmic gymnast until her career came to a premature end at the age of 18 as result of a spine injury. However, it wasn't her athletic parents who took her off to the Omsk School of Rhythmic Gymnastics at the age of six, but her grandmother who simply had a great love of gymnastics. Kanaeva was known for her perseverance. She would practice the most complex moves again and again, and at the end of every grueling training session she would go through the whole of her program again for her grandmother from start to finish. However, all Kanaeva’s efforts may have come to nothing if not for her good fortune to train in Omsk with future Athens Olympics silver medalist Irina Chashchina under the guidance of the same coach - Vera Shtelbaums. " There are those who are of the opinion that Kanaeva is a Chashchina and Kabaeva rolled into one. And indeed Yevgeniya really does have Alina Kabaeva's physical attributes and Chashchina's perseverance and single-mindedness. I am an experienced coach and I can tell you straight that talent isn't everything. Yevgeniya's main quality is her love of hard work,” Shtelbaums said. At the Aeon Cup World Club Championships in Japan, Kanaeva won her first international competition and was noticed by Russian rhythmic gymnastics team coach Irina Viner and invited to train at the team's special training facilities in Novogorsk. Russia's team has never lacked talent, so it was four years before Kanaeva performed for the first time in the senior division at the European Championships in Baku. Kanaeva was included in the team at the last minute, after team leader Alina Kabaeva had to pull out because of an injury. Kanaeva overcame the more experienced competitors to win gold. By the time of the Beijing Olympics Kanaeva was already the star of the Russian team. She won gold in the all-around competition with an incredible lead of 3.5 points. Kanaeva was taking rhythmic gymnastics to a new level. The year after the Olympics she won five gold medals at the European Championships in Baku, all the golds at the World Games in Taiwan and at the Student Games in Belgrade, Kanaeva was awarded the title "heroine of the games.” And then there were the six victories at the World Championships in the Japanese city of Mie, which broke the record set in 1992 by fellow Russian Oksana Kostina with five gold medals. Kanaeva became the first athlete to take so many golds at one World Championship. Kanaeva does not rest on her laurels, however. Kanaeva tries to learn from her victories and her mistakes. At the Moscow World Championships in 2010, she failed to make the finals in the ribbon due to a mistake in the qualifying rounds and only came second in the rope. "Of course I was extremely disappointed but this wasn't because I wasn't winning. On the contrary, I am always very happy for the other girls. They put in as much work as I do and they deserve their victories. On the other hand, I was furious with myself for letting down the people who had invested so much in me," Kanaeva said. "At the Olympics in Beijing, I dropped the rope in the qualifying round in the rope event. However, I still managed to make it into the final with my first marks. This was evidently meant to happen so that I would be more careful in the final and not make the same mistake again. These reminders are sent to test you and make you stronger." Kanaeva refuses to become a victim of her star status. She is still often the last to leave the training hall in order to perfect an element of her routine that won't work out. "When I was training and winning competitions I never thought about this side of being a medal winner - about the grand prizes, the presents and the invitations to high society events," Kanaeva said. "Sometimes it's difficult of course being in the training hall for eight hours a day, every day. But I love doing gymnastics. And it's my life."